The debate about banning plastic bags in Kenya has been causing a huge debacle over the past few months in the region. The light non-biodegradable plastic bags have been cited as a top environmental nuisance. The infamous plastic bags is everywhere, choking the rivers, streets and strewn across every tree in urban areas. 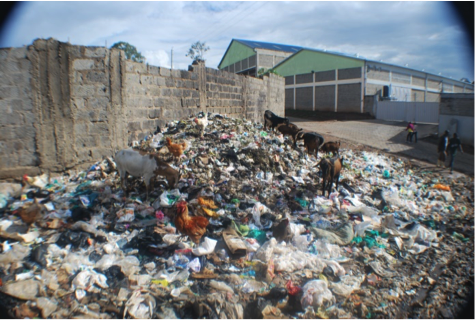 Activists around Kenya have been pushing for the ban on plastic bags and the government has been dragging their feet saying that an all out ban would lead to the loss of thousands of jobs and the loss billions of shillings in investments. This debate has pushed some citizens and organisation to take to the streets and come up with solutions themselves. One great example of such a person is Cypriano Ogoti, the founder of the Environmental Journalism Society of Kenya (EJSK) an organization that brings together like minded environmentalists, journalists and conservationists with a common goal of confronting the environmental challenges that face our beautiful planet and Kenya. Together they launched a campaign in 2015 that was aimed at reducing the amount of litter on the streets, sewers, parks and residential areas. With their newest project they aim to promote a sense of ownership amongst citizens and make them realise that they are the custodians of the environment which automatically makes them responsible for taking care of it. In order to highlight how dirty and unpleasant the litter was in the environment, they depict the difference between well maintained locations and neglected areas in the city. This project aims to address the issues by providing a cost-effective, easy to carry out and straight forward educational method that reaches a large number of the population and at the location of concern. The first phase of the project will be to galvanize public support, through a social media campaign that will target young urban citizens, by getting them interested in cleaning up the city. This social media campaign involves photo shoots with the theme “The power of contrast” which will feature professional models in an unkempt environment. Using the models they will go to Uhuru Park and the Railways Club for a professional photo shoot. The reason they chose Uhuru Park and the Railways Club is because it is well maintained area and the Railways location is always littered. The images are intended to send a message that will create awareness and sensitization of the need to stop littering at all costs. This will hopefully grab the attention of young people, and make people aware of the importance of a clean environment that we are all custodians of. The second phase of the campaign will be to mobilize the community to join mass clean ups around the country. The main objective of this phase is to persuade communities to share the message that “our” home and environment are “our” responsibility and that if it is clean we benefit as well our future generations. We hope everyone gets behind this amazing initiative!